Halloween is in just TWO days and I couldn't be more excited! Not just because it's the perfect excuse to eat candy all day, but for the perfect opportunity to play dress up again! Personally, I'm one to figure out a costume the day before or day of Halloween. And typically, they aren't the most creative (witch, cat, etc.). However, this year Lucas and I wanted to dress up together, so I figured I had to step my game up a bit. But what do you know, come less than a week 'til Halloween night and I still don't know what we're going to be. I started to brainstorm some costume ideas and realized, 'hey, I'm sure I'm not the only halloween costume procrastinator out there, why don't I share my ideas'! So with that being said, I compiled a list of 3 couple halloween costumes and 3 individual costume ideas for you guys that are all super simple to DIY and easy to recreate last minute! I picked this famous couple because one, they're very relevant right now and two, they both have very distinctive styles that are easy to recreate! For Kim's look, I picked one of her most popular outfit choices: a tight midi skirt, bodysuit, and heels! For Kanye's, of course I went with the t-shirt & pants look (wear black pants for best result), gold chain, and sneakers. To make it even more spot on and hilarious, you can add a baby-doll to represent little North!! I thought this one would be pretty funny and a little risqué; great for a Halloween party! For Marilyn's outfit, I just took this old 1950-60's party dress I got from Goodwill, curled my hair really tight, put on some red lips and a beauty mark, and threw on some heels! I figured people would understand that the guy is supposed to be JFK with a few educated guesses, so I thought a suit & tie, parted hair, and an American flag pin would be perfect! If you want to be more casual, you can throw on one of those tie t-shirts and pants! This one turned out super funny and adorable! For Wanda, just wear a yellow shirt and black bottoms. You can wear a pink wig like I did, or a pink bow and even hat will work too. Cosmo wears a dress shirt & tie with black pants; although, for a Halloween party, just wear one of those tie t-shirts or a white t-shirt to be more comfortable. Lucas wore jeans instead of black pants with his dress shirt & tie, which I thought was what made it look more cartoon-like (along with his short tie) and even better. For Cosmo's green hair, just throw on a green hat! Make some little crowns out of yellow paper and buy or make wands to complete your look! Who doesn't adore little ole Boo! 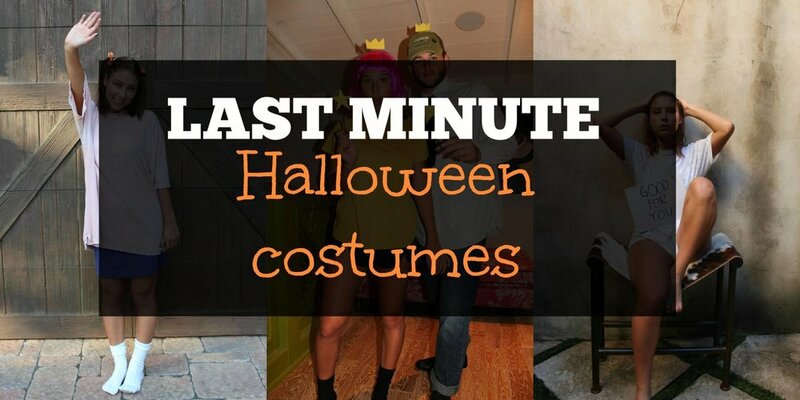 This costume idea is so simple that it's the best last minute costume. All you need is either a long pink tee, any purple bottoms, and white socks, or a t-shirt dress, purple socks, and some white sneakers! Last but not least, you can't forget the signature pigtails! This one is probably my favorite individual costume, yet it is the most simple. Slick your hair back (preferably after you take a shower) with a wet brush and hairspray, put on subtle and dewy makeup, throw on an oversized white t-shirt, and to make sure people know who you are, make a sign that says 'Good For You' and hang it around your neck! For this one, you can either wear cat face paint with heart sunglasses like I did, or you can paint hearts around your eyes as well! Then throw on some cat ears and wear all black! You can even pin on a cat tail, however, I kept the focus on my face and the ears to keep that emoji face vibe. If you try any of these costumes out, whether you do it individually or with a date, comment below or contact me on any of my social media accounts because I would love to check out your recreations!